While down in Mexico for a few days, I was fortunate enough to spend time with some newborn sea turtles and some crocodiles. Luckily, the sea turtles were in my hand and the crocodiles were on the other side of a fence, rather than the other way around. 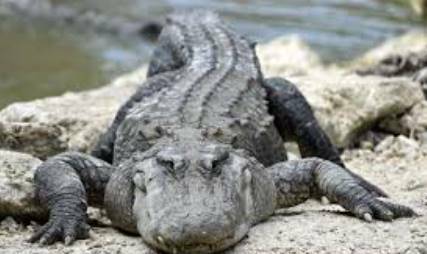 Here is some interesting information about the biological differences between crocodiles and alligators, along with the etymologies of both words. The two reptile groups are close relatives, so their physical similarities are expected. Snout shape: Alligators have wider, U-shaped snouts, while crocodile front ends are more pointed and V-shaped. Toothy grin: When their snouts are shut, crocodiles look like they’re flashing a toothy grin, as the fourth tooth on each side of the lower jaw sticks up over the upper lip. For alligators, the upper jaw is wider than the lower one, so when they close their mouths, all their teeth are hidden. Home base: Crocodiles tend to live in saltwater habitats, while alligators hang out in freshwater marshes and lakes. 1560s, “large carnivorous reptile of the Americas,” lagarto, aligarto, a corruption of Spanish el lagarto (de Indies) “the lizard (of the Indies),” from Latin lacertus (see lizard), with Spanish definite article el, from Latin ille. Kara’s vacation photo of some crocodiles (cocodrilos) near the ocean in Puerto Vallarta. These guys were waiting for us to feed them raw chicken. The largest ones (not pictured) were 14–15 feet long.